Since most cars on the road today have some form of Antilock Brakes (ABS) we should take a look at how they work and clear up some mis-information about them. As always, what we describe here is how most systems work in general. Since different manufacturers have their own versions of ABS their specifications and part names may differ. If you're having a problem with the ABS on your vehicle you should always refer to the specific service and repair manuals for your vehicle. The ABS is a four-wheel system that prevents wheel lock-up by automatically modulating the brake pressure during an emergency stop. By preventing the wheels from locking, it enables the driver to maintain steering control and to stop in the shortest possible distance under most conditions. During normal braking, the ABS and non-ABS brake pedal feel will be the same. During ABS operation, a pulsation can be felt in the brake pedal, accompanied by a fall and then rise in brake pedal height and a clicking sound. Front anti-lock brake sensors / rear anti-lock brake sensors. When the brakes are applied, fluid is forced from the brake master cylinder outlet ports to the HCU inlet ports. This pressure is transmitted through four normally open solenoid valves contained inside the HCU, then through the outlet ports of the HCU to each wheel. The primary (rear) circuit of the brake master cylinder feeds the front brakes. The secondary (front) circuit of the brake master cylinder feeds the rear brakes. If the anti-lock brake control module senses a wheel is about to lock, based on anti-lock brake sensor data, it closes the normally open solenoid valve for that circuit. This prevents any more fluid from entering that circuit. The anti-lock brake control module then looks at the anti-lock brake sensor signal from the affected wheel again. If that wheel is still decelerating, it opens the solenoid valve for that circuit. Once the affected wheel comes back up to speed, the anti-lock brake control module returns the solenoid valves to their normal condition allowing fluid flow to the affected brake. The anti-lock brake control module monitors the electromechanical components of the system. Malfunction of the anti-lock brake system will cause the anti-lock brake control module to shut off or inhibit the system. However, normal power-assisted braking remains. Loss of hydraulic fluid in the brake master cylinder will disable the anti-lock system. 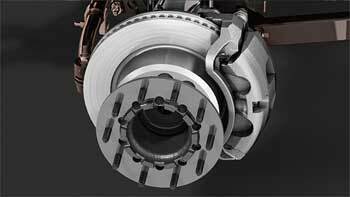 [li[The 4-wheel anti-lock brake system is self-monitoring. When the ignition switch is turned to the RUN position, the anti-lock brake control module will perform a preliminary self-check on the anti-lock electrical system indicated by a three second illumination of the yellow ABS wanting indicator. During vehicle operation, including normal and anti-lock braking, the anti-lock brake control module monitors all electrical anti-lock functions and some hydraulic operations. Each time the vehicle is driven, as soon as vehicle speed reaches approximately 20 km/h (12 mph), the anti-lock brake control module turns on the pump motor for approximately one-half second. At this time, a mechanical noise may be heard. This is a normal function of the self-check by the anti-lock brake control module. hen the vehicle speed goes below 20 km/h (12 mph), the ABS turns off. Most malfunctions of the anti-lock brake system and traction control system, if equipped, will cause the yellow ABS warning indicator to be illuminated. What ever the case may be, we here at Dana Brothers can diagnose the issure and get it fixed right the first time.